Franconia is a well known wine region of Germany, famous for it’s white wine ‘Silvaner’. During the months september and october you can buy the early, very sweet version of wine, called Federweißer. It is quite delicious, but you really have to be carefull not to drink too much because you hardly taste the alcohol in it. 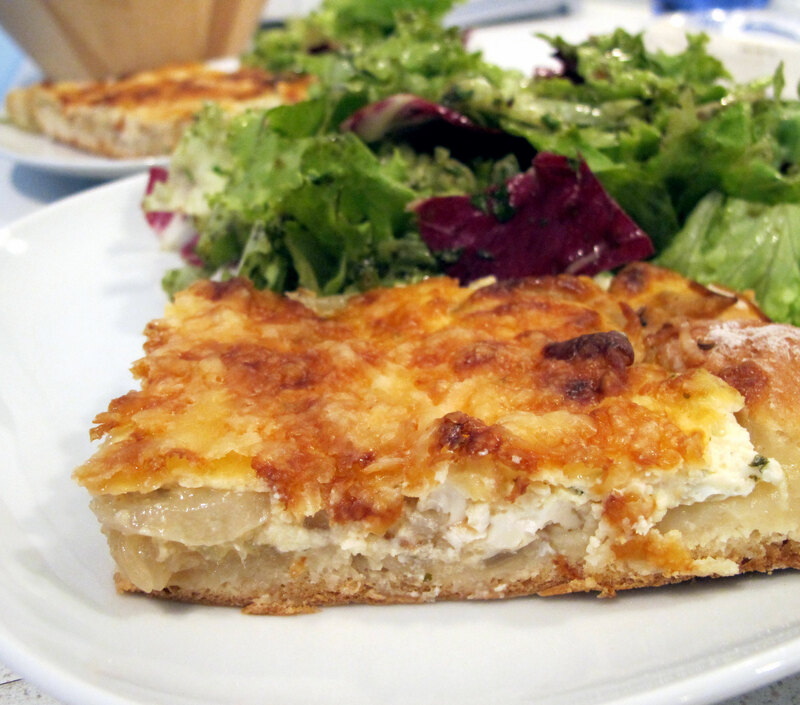 The traditional food that is served with this drink is onion tart. I guess I don’t have to tell you that the most delicious onion tart is made by my grandma. I tried so many times to duplicate her version, but I never equalled it. For some reason the dough was never as mouth-watering as hers. Finally I tried a dough out of the most traditional cookbook I own and found the missing ingredient. Any guesses? Yes, it was butter (everything tastes better with butter, doesn’t it?). The topping of my tart is from another cookbook, because I like the flat, but creamy version of onion tart. 1. Dissolve the yeast in the milk. Mix the flour with the salt and sugar in a large bowl. Spread the butter in thick flakes over the flour. Pour the milk with yeast over it and knead the dough until smooth. Let the dough rise for about 45min until it has doubled the size. 2. Cut the onions in rings and roast them in the oil until they are golden brown. 3. Preheat the oven to 175°C/350°F. Cover a baking tray with baking paper and roll the dough out on it. Spread the onions on the dough and salt&pepper them. Strew some caraway over the onions (about 1 teaspoon). 4. Mix the milk with the flour and boil it up. Let it shimmer at low heat for 5min – don’t forget to stir it! If you produce glob (I am not able to avoid that…) you can puree it with a hand blender. Melt half of the Edam in the milk. Fold in the crème fraîche and taste to flavour with salt and pepper. Mix the eggs with the topping and spread it evenly over the onions. 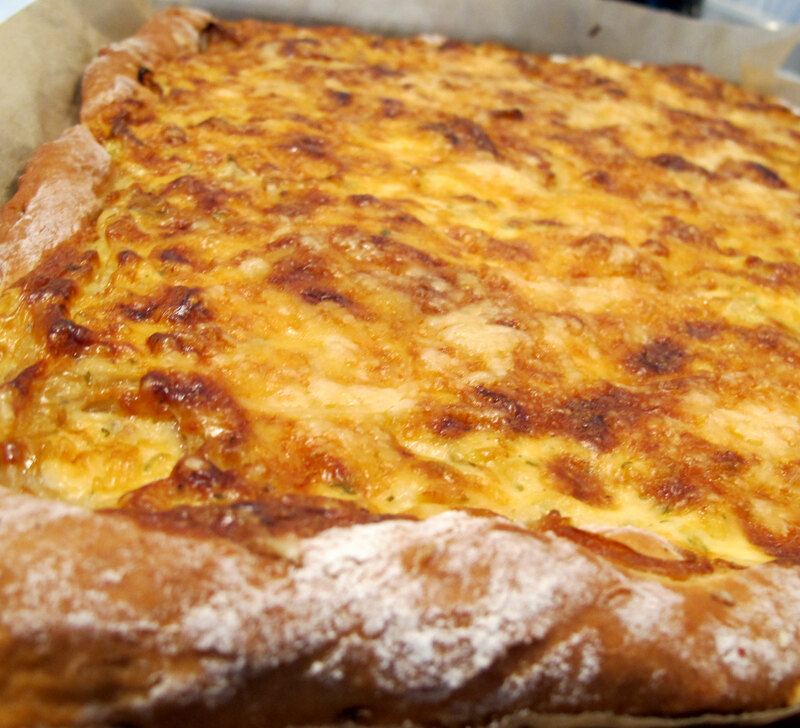 Strew the remaining cheese over the tart and bake it for 40min, until it has a golden brown colour. I know, this is still not as good as my grandma’s tart, but it’s definitely the best I can do!